Quantum Fuel Systems announced an order for their newest the VPLite21, a 20-foot modular container. The new customer, a utility company, distributes natural gas to residential, commercial and industrial customers and will temporarily place Quantum’s trailers at isolated locations with planned maintenance projects on the transmission pipelines or distribution systems. These mobile pipelines will allow the utility company to provide a continuous, uninterrupted supply of natural gas to their customers. 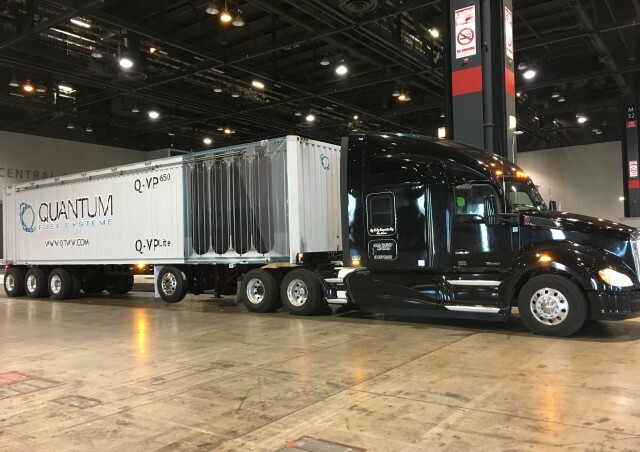 Quantum’s 20-foot modular container has a gaseous capacity of approximately 227,000 Standard Cubic Feet (SCF) and weighs less than 25,000 pounds empty, and less than 35,000 pounds fully loaded. It is equipped with 21 vertical Type 4 CNG tanks, which enables increased flexibility for customers that require smaller onsite storage capacity or have smaller project needs. The VPLite21 will start delivering in Q2, 2019 and will be certified for use in the United States and Canada, with worldwide availability to follow. The VPLite product line, at 3,600 pounds per square inch (psi), can carry up to approximately 530,000 standard cubic foot (scf) in the VPLite51, but is also available in configurations with less hauling capacity. Additionally, Quantum has a 5,000 psi trailer option.